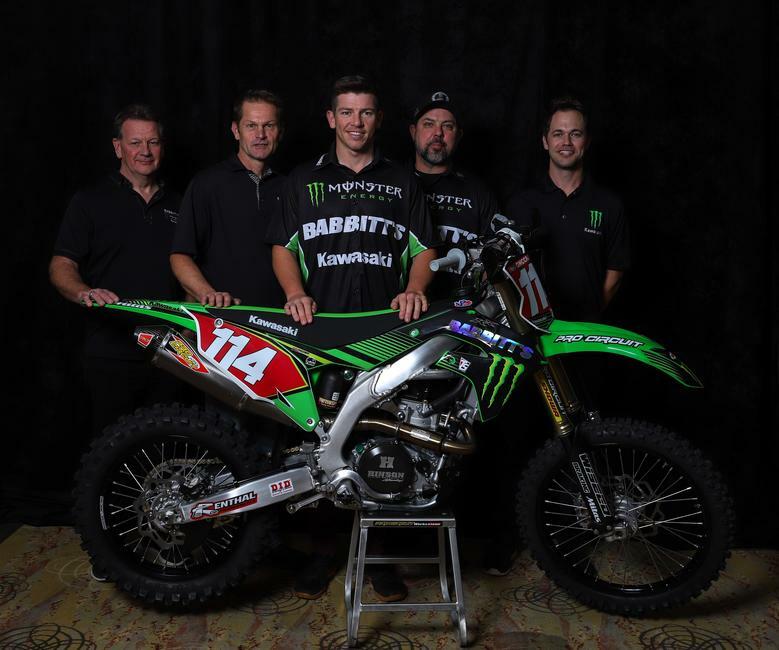 Foothill Ranch, Calif. (December 2, 2018) – Following the team introduction at the Grand National Cross Country (GNCC) banquet, Kawasaki Motors Corp., U.S.A. is pleased to introduce the Team Babbitt’s/Monster Energy®/Kawasaki Team Green™ effort that will field two XC1 class riders in the 2019 GNCC and Full Gas Sprint Enduro Series. With this effort, Kawasaki will continue a long and successful racing relationship with Team Babbitt’s Online where they captured eight of the last nine AMA Arenacross Championships from 2010-2018. Joining the team aboard his all-new KX™450 motorcycle will be former GNCC XC1 Champion and current Full Gas Sprint Enduro Champion Josh Strang. In addition to the Team Babbitt’s Online racing effort, Kawasaki Team Green™ will have a lot to offer off-road racers, including a $1.7 million racer rewards program with $427,700 dedicated to the GNCC series. The Team Green trackside support crew, featuring technical assistance and parts sales for customers will attend seven rounds of the 2019 GNCC series as well as other off-road race events across the country. For GNCC events where the Team Green trackside support crew is not present, the Team Babbitt’s Online semi will have a supply of OEM parts to assist KX™ customers in need. To further support our customer, racers can visit their Kawasaki Team Green dealer to earn up to a $1,500 rebate for the purchase of a new 2019 KX model. Kawasaki Team Green dealers have until February 15, 2019 to submit Racer Support applications. Team Babbitt’s/Monster Energy®/Kawasaki Team Green along with the Team Green trackside support crew will take on the treacherous terrain of the Big Buck GNCC season opener in Union, South Carolina on February 24, 2019. Visit https://www.kawasaki.com/racing/team-green/contingency to view the complete lineup of 2019 Off-Road events offering Racer Rewards. For the opportunity to earn a Kawasaki Team Green™ Racer Rewards payout, visit www.Kawasakisalesrewards.com to enroll. Once enrolled, racers will receive a Kawasaki Contingency Rewards MasterCard® that can be used at Kawasaki dealerships or anywhere MasterCard is accepted. All racers who are currently enrolled in the Kawasaki Racer Rewards program must re-activate their account each racing year beginning in January 2019. More information is available online at https://www.kawasaki.com/racing/team-green/contingency.